In our body's muscular system, Skeletal Muscles are the primarily muscle fibers that contain bands or striations (striated muscles) connected to bones and responsible for skeletal movements. The peripheral portion of the central nervous system (CNS) controls the skeletal muscles. Thus, these muscles are under conscious, or voluntary, control. The basic unit is the muscle fiber with many nuclei. These muscle fibers are striated (having transverse streaks) and each acts independently of neighboring muscle fibers. In our body, Skeletal Muscles are attached to the bony framework of the body (called the skeleton), control voluntary movements, such as walking, reaching, and talking. Every time the body moves, a skeletal muscle contracts. Depending on where they are located and how they function, skeletal muscles vary considerably in size and shape, but they are all made up of bundles of fibers. Each muscle fiber is made up of a sophisticated system of sliding filaments that, when "told" what do by the brain via the nervous system, cause contraction and movement. In our body's muscular system, the skeletal muscle, Tensor Tympani Muscle is the larger of the two muscles of the tympanic cavity (middle ear), contained in the bony canal above the osseous portion of the eustachian tube (auditory tube). In our body's head in the muscular system, the smallest skeletal muscles, Stapedius Muscle is a muscle that stabilizes the smallest bone, the stapes bone, emerging from a pinpoint foramen in the apex of the pyramidal eminence. In our body, Psoas Muscles, the skeletal muscles of the loin, is a powerful flexor of the thigh at the hip joint (psoas major muscle) and as a weak flexor of the trunk and lumbar spinal column (psoas minor). In our body's shoulder in the muscular system, the skeletal muscle Deltoid Muscle is a strong upper limb muscle part of the scapulohumeral muscle group, that superficially envelopes the shoulder joint anteriorly, laterally and posteriorly, classically divided into three anatomical portions; the anterior, the middle, and the posterior portions. In our body's shoulder, the Deltoid muscle arises anteriorly from the distal third of the clavicle, lateral and adjacent to the pectoralis major muscle. In our body, the Muscles of the Pectoral Region (Pectoral Region Muscles) are paired muscular system muscles of the pectoral region including, pectoralis major muscles, pectoralis minor muscles, and the subclavius muscles, that act on the upper limb and helps in inspiration (inhalation). In our body's head, the Oculomotor Muscles are the group of eight (8) muscles that move each eye. In our body's head, the Oculomotor Muscles include the extraocular muscles of the rectus muscle group (medial rectus muscles, lateral rectus muscles, superior rectus muscles, inferior rectus muscles), the inferior oblique muscles, the superior oblique muscles, and the levator palpebrae superioris muscle. In each of our body's shoulders in the muscular system, the skeletal muscles, Rotator Cuff Muscles are a group of four scapulohumeral muscles and their tendons including the infraspinatus muscle, supraspinatus muscle, supraspinatus muscle, and teres minor muscle, that act to stabilize the glenohumeral joint (shoulder joint). In our body's musculoskeletal system of the lower limb region, in the thighs, the Thigh Muscles are the anterior, medial, and posterior upper lower limb muscles. In our body's lower limb region, the Thigh Muscles groupings include the muscles of anterior compartment of thigh, muscles of medial compartment of thigh, muscles of posterior compartment of thigh, and the quadricep muscle group, and the hip adductor muscle group. In our body's muscular system, the Neck Muscles are the skeletal muscles located in the neck including: the platysma, splenius cervicis, sternocleidomastoid(eus), longus colli, the anterior, medius, and posterior scalenes, digastric(us), stylohyoid(eus), mylohyoid(eus), geniohyoid(eus), sternohyoid(eus), omohyoid(eus), sternothyroid(eus), thyrohyoid(eus) and other groups of muscles located in the organs housed in the neck such as the laryngeal muscles (vocal muscles) in the larynx (voice box) and pharynx muscles. In our body's mouth (oral cavity), the Palatal Muscles are the muscles of the palate including; glossopalatine, palatoglossus, levator palati(ni), musculus uvulae, palatopharyngeus, and tensor palati(ni). In our body's head, Facial Muscles (Mimetic Muscles) as skeletal muscles which support the masticatory system (stomatognathic system), including the subcutaneous muscles of muscles of facial expression (mimetic muscles), and numerous muscles supplied by the facial nerves, that generally originate on bone and are attached to and move the skin of the face. In our body's head, Facial Muscles are innervated by facial nerve (cranial nerve VII). In our body, Laryngeal Muscles (Vocal Muscles) are the striated muscle groups which move, as a whole or its parts, the larynx (voice box) including altering the tension of the vocal cords (vocal ligaments), and the slit size of the rima glottis. In our body, the Masticatory Muscles responsible as jaw elevators: the masseter muscles, temporalis muscle, medial pterygoid muscle (internal pterygoid muscle), and superior belly of the lateral pterygoid muscle. In our body, the Masticatory Muscles responsible as jaw depressors: the anterior digastric muscles, geniohyoid muscle, mylohyoid muscle and inferior belly of the lateral pterygoid muscle. 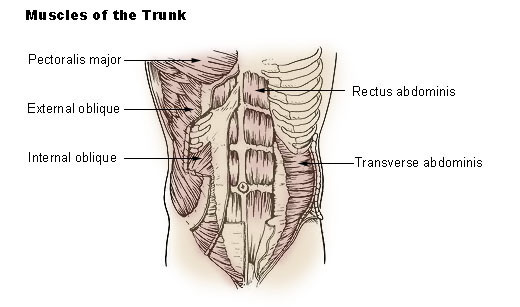 In our body's abdomen, the Abdominal Muscles are the muscles forming the abdominal wall including rectus abdominis, external oblique abdominis muscle and internal oblique abdominis muscle, transversus abdominis muscle (transversus abdominal muscle), and quadratus lumborum muscle. In our body's belly of a muscle, Muscle Spindles, as a type of mechanoreceptor found in some skeletal muscles, are sensory receptors, which primarily detect changes in the length of this muscle. In our body's belly of a muscle, the Muscle Spindles are Sensory Receptors, convey length information to the Central Nervous System (CNS) via Sensory Neurons.